Sit back and put your feet up on the Contemporary Rectangular Ottoman. The clean lines and modern feel of the ottoman make it easy to pair with a chair or sofa and can be used as an additional seat when entertaining guests. 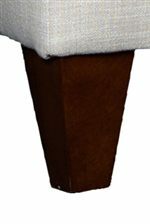 The Ottoman features an attached pillow top, upholstered base and sits on exposed tapered legs. The 6170 Contemporary Rectangular Ottoman by Mayo at Knight Furniture & Mattress in the Sherman, Gainesville, Texoma Texas area. Product availability may vary. Contact us for the most current availability on this product. Add a contemporary feel into your home with clean lines and modern details. 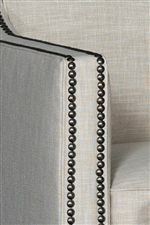 This collection gives you seating options to accent a room or complete your space. High Arms, tapered legs and decorative pillows make each a modern classic that will be with you for years to come. The 6170 collection is a great option if you are looking for furniture in the Sherman, Gainesville, Texoma Texas area. Browse other items in the 6170 collection from Knight Furniture & Mattress in the Sherman, Gainesville, Texoma Texas area.